"When the Sun died, I went up to Heaven and saw God and all the people who had died a long time ago. God told me to come back and tell my people they must be good and love one another, and not fight, or steal or lie. He gave me this dance to give to my people." With these words, spoken by a Paiute rancher named Wovoka to describe a dream he experienced during a full eclipse on New Year's Day of 1889, the Native American Ghost Dance religion came into being. Few people, either Native or white, could have imagined the tragedy which would arise from this new faith within two years of this jolting statement. But while the brief and bloody history of the Ghost Dance has been well documented, the story of its creator remains curiously elusive. Few people have had a more profound effect on Native American history as Wovoka, yet his story has nearly been lost to time. Wovoka was believed to have been born in the year 1854 in the Sierras of Nevada. By the time of his birth, white settlers had already laid stake to the territory and the Paiute nation saw its world degenerate into a state of cheap labor for the white man. In 1870, Wovoka's father Tavibo died and his teenage son became attached to the family of a white rancher named David Wilson. Both Tavibo and David Wilson had a strong theological effect on the young Wovoka, shaping his religious concepts with two very different notions of faith. Tavibo was known as a prophet among his people and preached the concept of a religious dance when Wovoka was still a child. Tavibo claimed that he went into the mountains to speak to the Great Spirits, where he was told the land would open up and swallow the white man, leaving only the Native peoples to inherit the Earth back. However, most of the Paiute people did not believe this and Tavibo went back to the mountains, returning with a second revelation that all of the Native dead would be resurrected and join those who would reign in this new Natives-only world. This prophecy also failed to gain root and Tavibo returned to the mountains for a third time, coming back to his people to warn that those who did not follow the dance of his prophecy would be damned with the white men who were predicted to disappear. Curiously, history has recorded many tribal prophets of different nations who shared common visions and warnings. None, up until the time of Wovoka, ever captured a wide following. While Tavibo's standing as a prophet waned with each new visit to the mountain, Nevada found itself at a unique theological crossroads. The settlers from the east brought Christianity and missionaries of the Catholic and Mormon faiths worked zealously to "save" Native peoples. (Some historians claim that Wovoka briefly practiced the Shaker faith, which enjoyed some degree of popularity in the east since colonial times, but there was also a Native religious movement known as the Shakers from the Puget Sound area of Washington State, which shared similar rituals and prophecies with Ghost Dance. Perhaps there is confusion between the two Shaker movements, though research has not confirmed Wovoka's devotion to either faith.) It was under David Wilson's protection that Wovoka (who was renamed Jack Wilson) became exposed to Christian concepts. As part of the Wilson household, Wovoka earned the scorn of some of his people, who claimed that his father was really Wilson and not Tavibo. The fact that Wovoka's complexion was light-skinned and that Tavibo translated as "white man" only aggravated the rumors. It is possible that the gossip generated by this contributed to Wovoka's claims that he would save the Native peoples. Wovoka eventually left the Wilson household and returned to live among the Paiute; the reason for this departure from his adopted family is not known. By the morning of January 1, 1889, Wovoka was clearly a man torn apart by the conflicts of his past. His father's failure to be taken seriously as a prophet, the suffering of the Native peoples and his own religious concepts (both tribal and Christian) weighed heavily on him. On that day, Wovoka claimed to have dreamed a vision of a new and glorious world for the Native peoples. But was it really a new world? In his dream, Wovoka conversed with God, who promised a new world set aside for the Native peoples. The wildlife of the region which was nearly depleted by white settlers (buffalo, elk, deer) would be replenished. The white settlers would vanish en mass and the Native dead would be resurrected and reunited with their living ancestors. Suffering, starvation, pain and disease would be wiped away forever. From a theological viewpoint and the safety of hindsight, however, one can detect prophecies which were not tribal in origin. Even the most casual churchgoer would recognize the visions of the Book of Revelation in Wovoka's prophecies. Yet Wovoka's audience the Paiute people and, later, other tribal nations did not recognize it simply because Christianity did not take root among the Native peoples. White missionaries, for all of their efforts, did not put their faith into the hearts of most Native peoples. Wovoka, obviously recognizing this, refashioned the Revelation warning to his world. He claimed the Native peoples would receive God's favor since it was the white man who rejected Christ. And unlike the New Testament, which was vague concerning the time and place of God's new world, Wovoka spelled out the immediacy of what he said. "Jesus is now upon the Earth," he stated. But again, there is historic contradiction here Wovoka is quoted as saying he was Christ and he wasn't Christ. It would seem that either he excelled at playing to different audiences or was damned to being preserved by faulty historians. Wovoka added this new world for Native peoples would come, but only if a ritualistic dance was practiced. In his initial preaching, he instructed his audiences to dance five days and four nights, then bathe in a river and go home. Wovoka promised to send a good spirit to his followers, who were to return in three months, at which time he would promise "such rain as I have never given you before." The ritualistic dance, which became known as Ghost Dance, clearly appealed to the Native peoples who were baffled by the pew-bound protocol of Christian faiths. Unlike the calls of his father Tavibo, Wovoka found an audience eager to follow his teachings. Ghost Dance spread to different nations throughout the west with a speed and ferocity unrivaled by any religious frenzy of the day. This turn of events was all the more remarkable for three reasons: the geographic and language barriers among the various nations, the lack of access to media or technology for spreading this news, and the fact that Wovoka never left the Paiute land. Instead, members of other nations came to Nevada to learn from him. Why Wovoka did not travel could be attributed to either a fear of unknown territories, a lack of funds to accommodate travel or even the possibility of enemies. In the summer of 1890, among those who visited Wovoka were two members of the Lakota reservation at Pine Ridge, South Dakota, named Kicking Bear and Short Bull (pictured on this page). They became enraptured by Wovoka's faith and even stated that Wovoka levitated through the air above them. Kicking Bear and Short Bull brought Ghost Dance back to Pine Ridge, but in a very different form which lead to totally unexpected results. Wovoka's faith was based on non-violence with whites. In fact, he even urged his followers not to tell the whites what they were doing. 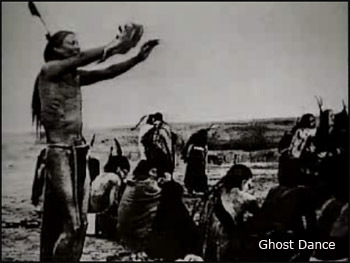 But as interpreted by Kicking Bear and Short Bull, Ghost Dance took on a militaristic aspect. Special garments known as Ghost Shirts were to be worn to deflect bullets fired by white soldiers or settlers. Government agents were permitted to witness the Ghost Dance ceremony and were told what it meant. Kicking Bear and Short Bull added the Indian Messiah would appear to the Lakota in the Spring of 1891. Blame for Ghost Dance was placed on two people. 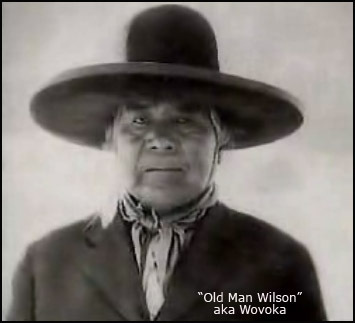 Wovoka was traced as the father of the Ghost Dance and was interviewed by James Mooney, an ethnologist and anthropologist with the Smithsonian Institute. Wovoka passed a message to Mooney that he would control any militaristic uprising among the Native peoples in return for financial and food compensation from Washington. The offer was ignored. And blame was also put on Sitting Bull, the chief medicine man of the Lakota people. Ironically, Sitting Bull was apathetic to Ghost Dance and only allowed its introduction at Pine Ridge with great caution. His initial qualms were realized: government agents considered Sitting Bull responsible solely due to his leadership role among the Lakota. Tribal police were dispatched to arrest him, but his apprehension resulted in conflict when several Lakota fought to protect him. Sitting Bull was killed in the crossfire on December 15, 1890. Fourteen days after Sitting Bull's fatal shooting, the U.S. Army sought to relocate and disarm the Lakota people, who failed to stop their Ghost Dance. On the frozen plains at Wounded Knee on the Pine Ridge Reservation, government troops opened fire on the overwhelmingly unarmed Lakota people, killing 290 in a matter of minutes. Thirty-three soldiers died, most from friendly fire; 20 Medals of Honor were presented to surviving soldiers. As news of Wounded Knee spread throughout the Native nations, Ghost Dance died quickly. Wovoka's prophecies were hollow; the land would not be returned from the white man through divine intervention. With the suddenness of its birth, Ghost Dance disappeared. Wovoka himself virtually vanished into obscurity. In his later years, he exhibited himself at sideshows in county fairs and worked as an extra in silent movie Westerns. (The one surviving photograph of Wovoka was taken on the set of a film.) By the time of his death on September 20, 1932, he was virtually forgotten by both white and Native peoples. It would not be until the 1970s and the birth of Native American activism that the story of the Ghost Dance was told again even if its father's life was reduced to footnote status. The tragedy of Wovoka is a legacy of pain and suffering among the very people he wanted to save. The songs of the Ghost Dance are silent today and the dream of Wovoka vanished in the harsh light of reality. The Christian principles which he laced into his theology were brutally ignored by the soldiers and settlers who held allegiance to Christ and yet destroyed the Native way of life with a brutality unknown in the Gospel teachings.